In this week’s edition, we review the latest price movements of the major coins, struggle to understand whether or not the bottom of the 2018 bear run has shown itself, and cover some of the other items that have been dominating the news over the past few weeks. It was a new week of lows for cryptocurrency, as the price of BTC struggled to remain above $3,200 and the total market cap of all coins above the $100 million mark. As of early Monday morning, BTC was down slightly over 7%, Stellar (XLM) down 17.5%, and Bitcoin Cash (BCH) and Bitcoin SV (BSV) faring the worst out of the top ten, with each half of the Bitcoin Cash fork falling about 22%. For the first time in 2018, Litecoin (LTC) actually surpassed BCH in terms of market capitalization, currently standing with a valuation of about $1.64 billion as compared to BCH’s ever-falling $1.45 billion. The flip in ranking position does not really signify a victory for LTC so much as it does a loss for BCH, as it becomes more apparent with each passing day after the fork that there were to be no real winners in the great Bitcoin Cash hard fork debacle that shook the markets and left a trail of devastation and losses in its wake. Almost all coins were now down 95%+ since the beginning of the year, with many down as much as 99%. Even bitcoin itself had shed 50% of its value in only the last 30 days. An optimistic point to come out of last week’s news was the fact that, despite its 85% drop in 2018, bitcoin has still fared far better as an investment than Google or Apple over the last 2 year time period. Indeed, BTC was still up over 400% during a period when Apple (AAPL) was up 74% and Google (GOOG) was up 70%. While its possible to move time frames around to paint bitcoin as a terrible investment (for instance, if one were to look at its year-to-date track record), in the medium to long term, it remains one of the most profitable investments that could possibly be made going back to 2010 – far outperforming any sort of stock, commodity or even real estate investment. Former White House Chief Strategist Steve Bannon also had a long-standing history with cryptocurrency before joining the Trump Administration. Aside from sitting on the board of directors at the gaming-related, Brock Pierce-led IGE group, Bannon announced plans that he was making his own “deplorables” cryptocurrency in July of this year. It’s true that Initial Coin Offering (ICO) activity has been on the decline throughout the entirety of 2018; part due to a bearish trend in the markets, part due to an oversaturation of the market, but part is also definitely due to the fact that they have caught the eye of the U.S. federal government. Now hundreds of millions of dollars less in the taking since the end of 2017, ICOs have been under increased scrutiny, not only because of their enhanced size and scale but chances for fraud of investors as well. Among the tools added to the SEC’s arsenal for fraud detection is an increased understanding of blockchain analytics and the development of highly powerful analysis software that can help trace the paths to and from cryptocurrency taken by scammers, an art which is helped by the fact that many scammers (incorrectly) believe themselves to be anonymous through the blockchain. All-in-all, 20 cases have been brought against ICO scammers by the SEC in 2018 so far – a vast increase from 2016, a year which failed to garner a single mention from the federal watchdogs. 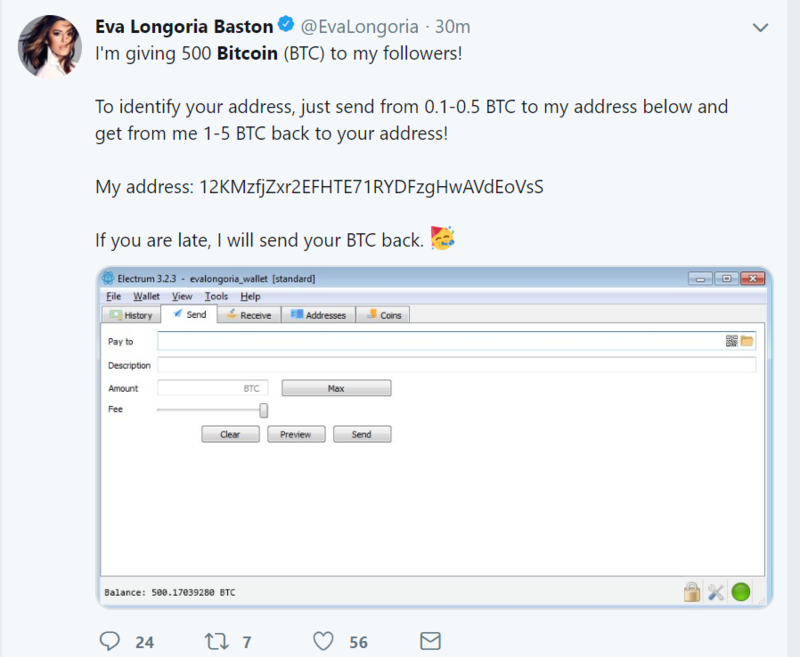 Scammers posing as billionaire CEO Elon Music managed to fleece almost $200k from Twitter users in the latest BTC scam to rock the popular social media platform. Crypto icons like Vitalik Buterin and Andreas Antonopoulos have already been the targets of such scams, but this latest one seems to have taken in a lot more BTC than usual, perhaps due to the fact that the hackers managed to obtain a “verified” Twitter account and change all of the information to resemble Musk’s Twitter page. Twitter quickly commented on the incident, vowing to issue changes to the platform that make it harder for “verified” accounts to be commandeered and adjusted for the purposes of running scams. A recently published study from geologists at the University of Hawaii concluded that the Bitcoin Network could indirectly increase global temperatures by an average of 2 degrees Celsius by 3030, contingent on a substantial rise in user adoption, which would correlate with an increase in the network hash rate required to successfully mine new blocks. Currently, the electricity generated that is required to run the Bitcoin Network is estimated to consume 69 million tons of carbon per year – a number that is expected to be on the rise with each passing year. The study notes that a lot of bitcoin mining is performed in countries which use coal and fossil fuels as the primary means of electricity generation, such as China and other countries in eastern Asia. However, critics of the study noted that its conclusions are based on a lot of assumptions and conclusions of a reality which may not come to pass. Chiefly, they point out that the authors failed to account for a worldwide trend of decreasing reliance on fossil fuels for power generation, a potential migration of mining activity to areas which use cleaner forms of energy (such as hydroelectric or solar power), or the possibility that bitcoin adoption may not be as widespread as the study assumes. At any rate, the Bitcoin Network still consumes more electricity on a daily basis than many countries around the world – 160 of them to be exact – with its current energy usage (between 58 and 73 terawatts per hour) rivaling that of the country of Austria, which is home to almost 9 million people. Though the amount of electricity consumed has flatlined in the latter half of 2018, it is unlikely that its current rate will ever be diminished, as network hash power tends to go up a lot easier and faster than it goes down. The study did not include other Proof of Work (PoW)-type coins which also require vast amount of electricity to perform huge amounts of computations, such as Ethereum (ETH), Bitcoin Cash (BCH), and Litecoin (LTC), though all other PoW coins combined do not come close to equaling the amount of electricity needed to run bitcoin. A string of bomb threats rocked the west coast of the United States over the last week. Each bomb threat had a few things in common, chiefly, they all demanded $2000 to diffuse the detonation of the bomb, and they all demanded the $2000 be sent in denominations of bitcoin to the same, particular bitcoin address. Though no bombs were actually discovered at any of threatened locations, the affair has proven to be highly disruptive as it is generally the policy of every major business and institution to take every bomb threat with the utmost of seriousness. “Wrapped Bitcoin” is coming to Ethereum, set to provide a new source of stability during the trading of Ethereum tokens. Wrapped Ethereum (wETH) already exists as a popular ERC20 trade pairing, as ETH itself is not actually a token but can be tokenized by setting aside a portion of ETH in a designated fund, using it to back wETH tokens denominated in terms of ETH. This stablecoin-like procedure is now being applied to bitcoin (wBTC), which has the benefit of not only making it easy to trade BTC against ERC20 tokens in DEXs but also removing a portion of BTC from circulation, thus potentially increasing its value. Plans for the introduction of a “Wrapped Bitcoin Cash” are also underway. The Winklevoss Twins are in the news again, this time for going after bitcoin’s famed “first felon,” Charlie Shrem, who served a little more than a year in a federal penitentiary for helping users of the original dark net market The Silk Road obtain bitcoin. Cameron and Tyler Winklevoss are accusing Shrem of with-holding about 5,000 bitcoins after they hired him to purchase thousands of bitcoin on their behalf in 2012. At the time, bitcoin were only worth approximately $120, but the Winklevii suspect the funds Shrem used in his recent spending spree (to purchase 6 properties, 2 Maseratis and 2 power boats) were garnered back at the time of their agreement. In another exceptionally clever idea for an ICO, a company by the name of Planetary Resources has teamed up with crypto firm ConsenSys in order to raise funds for a venture dedicated to mining asteroids for resources. Starting out in 2009, the company has already raised $50 million in private investor funds and launched 2 satellites; however, funds have since dried up and it proposes a round of ICO funding in order to help boost business back into orbit. Bitcoin wallet masters blockchain.com are currently in the process of giving away $25 in Stellar Lumens (XLM) to the first 3 million respondents of its wallet holders in an attempt to help increase adoption of the fast-rising coin. Blockchain.com recently integrated Stellar into its user wallets, making it the 4th coin it currently supports. Blockchain.com wallet owners can claim their free Stellar from the website here.